Get the Peak 10'6" inflatable SUP at a great price by visiting Amazon.com! Peak 10’6” Inflatable Standup Paddleboard: Should You Buy It? Standup paddle boarding is not only fun, but it can also be relaxing, especially when it is done amidst a calm surrounding. There have been some variations in its use, including yoga while on the board. To make sure of the optimal experience, it is important to carefully choose the best iSUP. If you are wondering what to purchase, one of the best options that can be taken into account would be the Peak Inflatable Standup Paddleboard. Keep on reading the rest of this review and know more about this product. Among others, one of its most notable features is the use of military-grade PVC and drop-stitch material, which are considered to be amongst the best, providing you with the guarantee of its durability and reliability. The 6-inch thickness of this iSUP is one more feature that makes it stand out from most of the models that are available on the market. In most cases, standup paddleboards have thickness of only up to 4 inches. Since it is thicker, you can expect that it will remain stable. It also features a non-slip grip, and a good deck size. It has dimensions of 10’ 6” inches long by 31” wide by 6” thick. The board weighs 23 pounds and the included paddle has an adjustable length of 65 to 86 inches. It can support a maximum rider weight of 300 pounds. 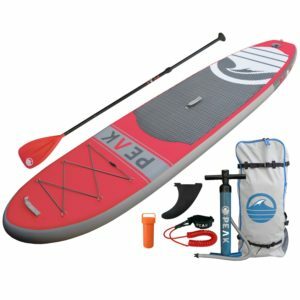 The Peak Inflatable Standup Paddleboard comes in a complete package, providing you with all the things that you need to get started on your adventure. It is inclusive of 3-piece aluminum adjustable travel paddle, carry back pack, coil ankle leash, high-pressure dual action pump with pressure gauge, removable travel fin, and repair kit. Sturdy: From the materials used and the overall construction, you can expect that Peak Inflatable Standup Paddleboard will last long. User-Friendly: This is a major reason why it is considered by many to be a good choice for the best iSUP. From inflating to deflating, you can have it accomplished in a snap. Easy to Carry: The lightweight construction of the board makes it easy to bring wherever you are headed for your next adventure. Poor Quality Paddle: Much like in the other models of iSUP, one of the most common complaints deal with the quality of the paddle, which many assert to be flimsy. With 4.6 out of 5 rating from Amazon and a bunch of satisfied customers, the Peak Inflatable Standup Paddleboard can indeed prove to be an outstanding choice. It has a high weight limit, exceptional durability, impressive stability, and comes with complete accessories.